While an aide was caring for my mother, I went to the farm this afternoon to meet a dog trainer. 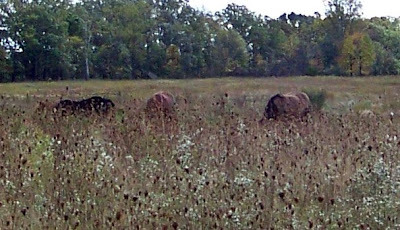 He wants to train his dogs in a space where he can shoot out some kind of thing for the dog to retrieve and it turns out my newly brush-hogged hay field will work perfectly. 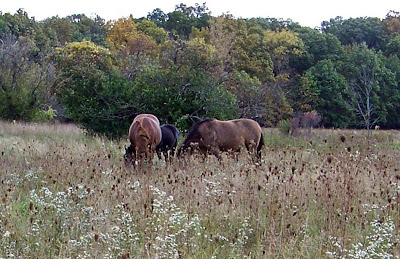 The horses were in the front pasture, eating between the weeds in the paths we've created with the brush hog. 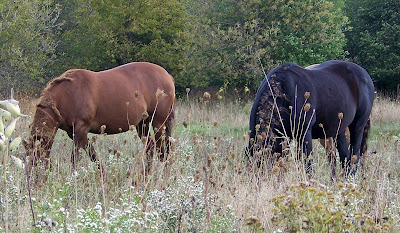 They're all looking pretty fat and sassy, but they weren't sassy - we drove two trucks through the pastures to the hay field and the horses paid no attention at all. Only Weaver even looked up. Weaver and Manly look like stuffed sausages almost ready to burst. I think Manly is right up at the top of my list of the most beautiful horses ever born. I'm really sorry my loss of physical adeptness has kept me from ever enjoying riding him. His back looks so broad it would be like sitting on a big couch. After the dog training use of the hay field was arranged, I took my (second) new rowboat over to the public access point on Whitmore Lake. I bought this boat with the idea I could handle it better by myself than the first boat that required a trailer and is just too heavy for me. There were other people at the access point, taking pontoon boats out of the water. 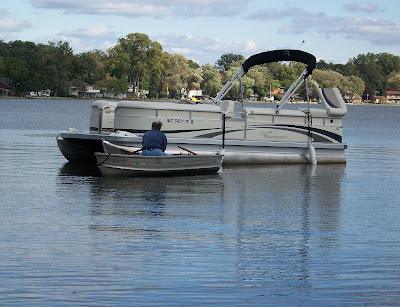 I waited while one beautiful boat was loaded on a trailer and hauled out of the lake, then backed my truck up to one side of the dock while another pontoon trailer was backed in on the other side. Somehow, while I was getting my truck in a good spot, the men with the second pontoon boat lost it. There was a pretty good wind and by the time I saw what was happening, their boat was heading toward the center of the lake. I got my boat out quick and let one of them take it out to catch the boat. The little boat moved pretty fast and the guy caught the pontoon boat right away, but that didn't end the trouble. The wind was a little stronger than the rowboat and the pontoon boat was headed for shore, or at least for shallow water where the sand would have ruined the motor. 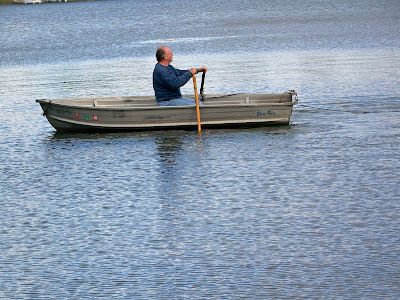 The other fellow had to run over and get into the rowboat so he could get on the pontoon boat and start up the engine. They brought the pontoon over to the dock, then helped me a lot by pulling my boat up on the dock and emptying the rainwater out. They even held the boat for me while I got in (and getting into this boat wasn't scary like it was when I was getting into the first boat, somehow I wasn't too stiff today to swing my legs over and turn around on the seat). I rowed out to the point of land that was blocking the wind, making the access point into a sort of cove, and found that the wind was pretty strong and it was going to be a lot of work holding my boat against it. I figured I'd done as much rowing as I should for the first time in half a century, so I rowed back to the dock. One of those nice men had fixed the tailgate on my truck (I had just jammed it on and he put it on the right way) and then they helped me load the boat. I now know that I could handle it all by myself, but it was very nice not having to do so. I'm not sure what is happening, maybe I look old and decrepit, but I have had more people do nice things for me this year. Every time I'm really in over my head, it seems someone steps up and helps me - there's Jim who plowed my driveway all last winter and brush hogged the hay field all summer, there's Bobby who has helped me for years and over last weekend mowed the yard at the farm where the grass was knee high and fixed my lawnmower. When I bought my brush hog, the husband of the woman who delivered it took it home and filled the oil and got it ready to run - and I've never even met him. At the grocery store, I've had perfect strangers offer to help me load my groceries into the car, I've had people offer to load the fifty pound bags of dog food. Now, sure, those boat men would have been in big trouble if my little 12' boat hadn't been there, but they were offering to help me and giving me suggestions before their big ol' 22' boat drifted off. In fact, they probably missed seeing their boat getting loose because they were guiding my truck back to the right spot to unload my boat. Maybe the economic downturn has made people kinder.